Yeah, not really, but it’s getting close! Yesterday was warm as all get out, so instead of band practice, me and the fellas got together with some beer and…bratwurst? Not a hot dog, but a worthy grilling entity unto itself. 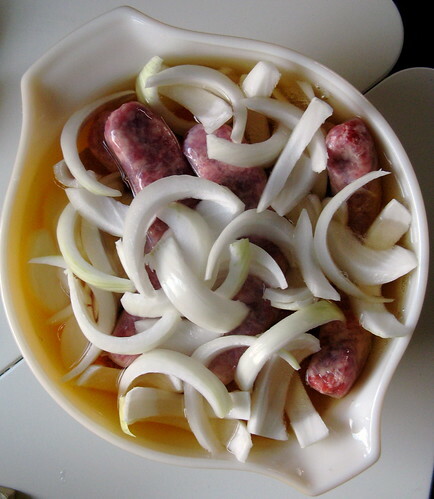 Get bowl, put in bratwurst, put in one large cut up Vidalia onion, cover with beer (this time was ice cold PBR). Let sit 30-45 minutes while engaging in other summertime beer shenanigans. Now don’t get all up in arms about not boiling them in beer first. That step is for people who watch too many Johnsonville Brat commercials, cook everything on the grill at super-duper-hot direct temperatures, and like stinky kitchens. 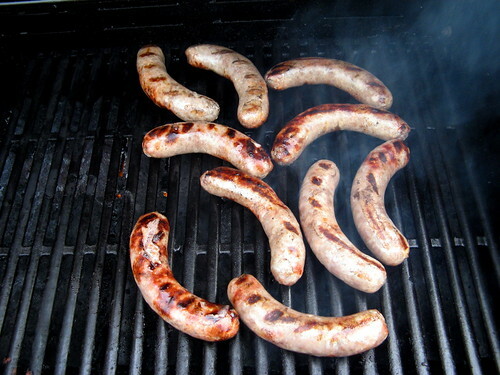 Anyway, put the brats on the grill. In this instance, we used the inferior, yet supremely convenient, gas grill. Set one side on high, the other on low. Brats go on low side. Do this with charcoal by putting coals on one side, derrrr. Keep lid open. Just like a hamburger, FLIP ONCE. After the flip, put onions on. Sean had a nifty metal basket. You can use tin foil. Close lid here. Closing the lid will shoot the inside temp up 150 to 200 degrees. Since the skin is now toughened up, the insides will “boil” in their own juice and beer marinade. See what I mean about skipping that stinky boiling process? This is a grilling session, nothing else! 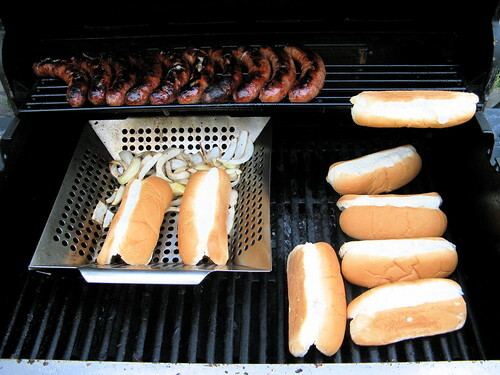 Once brats are close to being finished, open ye olde grill (and keep open, dropping the temp back down), where I tossed em on the top rack to rest, and let ’em drip into the onions. Turn the heat off and toss on some buns for a few minutes to toast ’em up a bit. 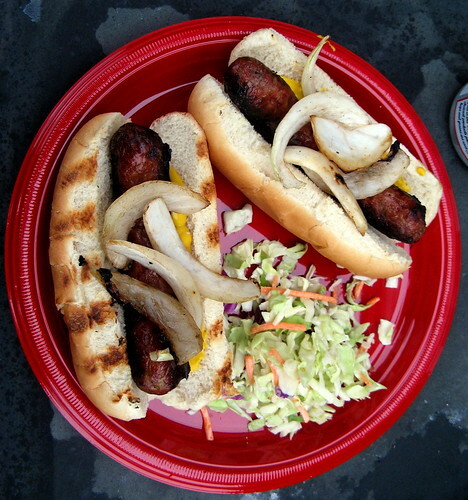 10 brats, 8 buns, giant onion, slaw: $11 and some change. PBR, Newcastle, plates, napkins, and 2 kinds of mustard (I’m a French’s yellow kind of guy) supplied by Sean.